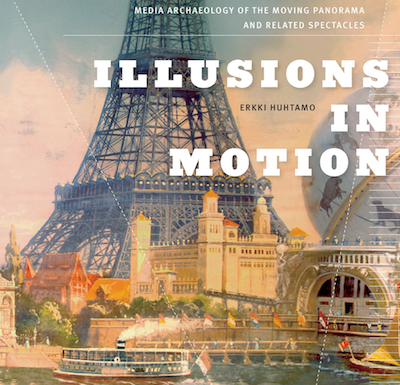 Illusions In Motion, by Erkki Huhtamo, is the first comprehensive history of the moving panorama, which, as the author demonstrates, was a significant departure from conventional static panoramas: "Instead of being surrounded by a stationary wrap-around painting, the spectators sat in an auditorium. A long roll painting was moved across... by means of a mechanical cranking system." These events were early examples of multi-media spectacles: "The presentation was accompanied by a lecturer, music, and occasionally light and sound effects." In this respect, they were antecedents of Japanese kamishibai (performed by kamishibaiya), and silent film screenings in Japan and France (narrated by 'benshi' and 'bonimenteurs', respectively). Moving panoramas were influenced by Chinese landscape scroll paintings (the most famous being 清明上河圖, reproduced in A World History Of Art) and Japanese 'emaki' narrative scrolls (discussed in Dietrich Seckel's book Emakimono). Illusions In Motion surveys a hundred years of moving panoramas, from their beginnings in the early nineteenth century (the hybrid 'peristrephic' panorama, with its concave display) to their demise: "After the First World War the moving panorama's era was over." Huhtamo's book, like Oettermann's, contains only black-and-white illustrations. (Most of Huhtamo's photographs illustrate objects from his own collection.) Oettermann's book was the first English-language history of panoramas. Comment's work is less comprehensive, though it has colour illustrations and even fold-out panoramas. Huhtamo discusses the moving panorama's relationship to other media and entertainment, such as theatrical performances (the mechanical Eidophusikon), magic lanterns, and dioramas. He also profiles the leading panorama artist of the Victorian era, Albert Smith: "Smith's Ascent of Mont Blanc (1852-1858) was arguably the most successful moving panorama show of all times, performed for seven years in a row at the Egyptian Hall in London." Illusions In Motion is subtitled Media Archaeology Of The Moving Panorama & Related Spectacles, and Huhtamo uses his research into the moving panorama as a case-study of the 'media archaeology' methodology: "It will demonstrate a way of doing media studies I call media archaeology... the book is meant to be read as a kind of discours de la methode." 'Media archaeology' is derived from CW Ceram's book Archaeology Of The Cinema (1965), which was later used as the subtitle of Laurent Mannoni's comprehensive The Great Art Of Light & Shadow (2000). Ironically, Ceram was an influential archaeological historian, whereas later uses of the term are purely metaphorical. According to Huhtamo, media archaeology involves digging in archives and "excavating" artefacts, though isn't that what any good researcher has always done? I fail to see how media archaeology differs from conventional investigation of primary sources. Huhtamo's wider intention, of challenging the conventional grand narrative of media history, is more interesting than his terminology, and he argues that media archaeology "reassesses existing media-historical narratives". His aim is to document the neglected media forms that fall outside the linear narrative of modern media development: "Media archaeology corrects our understanding of the past by excavating lacunas in shared knowledge."